With its IPS panel and 1600 x1200, resolution, the FlexScan S2133 is ideal for businesses and control rooms that need to display a large volume of data as well as for CAD and other design work that require brilliant color display. With a 21.3-inch screen and a 1600 x 1200 native resolution, the FlexScan S2133 displays a large volume of information so you can scroll less and work more efficiently. Adjust the screen to the most comfortable position with 82 mm height adjustment, 40° tilt, 70° swivel, and 90° rotation for portrait mode. Compatibility with VESA mounting standards allows the monitor to be removed from the stand for mounting on a movable arm or wall bracket. 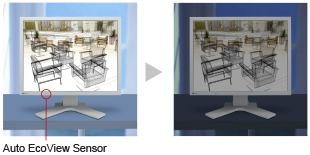 The Auto EcoView ambient brightness sensor on the front of the monitor measures ambient light and optimizes the screen's brightness so the screen is never too bright or too dark. This reduces both eye strain and the monitor’s energy consumption. 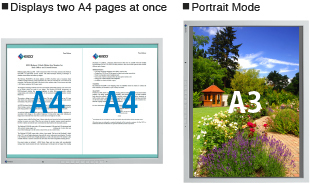 For optimum viewing of different kinds of content, EIZO's Fine Contrast function includes modes for office applications (Paper mode), video (Movie mode), web browsing (sRGB mode), and user-defined settings (User modes 1 and 2). Toggling between modes can be done manually in the OSD menu or automatically by assigning a mode to a particular application with the bundled ScreenManager Pro for LCD software. Paper mode produces tones and contrast similar to those of printed paper. Together with the Auto EcoView ambient brightness sensor, Paper mode makes reading documents and ebooks more comfortable and reduces eyestrain. With a maximum brightness of 420 cd/m2 and a contrast ratio of 1500:1, the screen remains visible under daylight conditions and brightly lit rooms. A USB hub with one upstream and two downstream ports is included. The DisplayPort and DVI-D 24 pin connectors and HDCP compliant. By connecting to an HDCP enabled computer, you can display digital copyright protected contents from digital streams and Blu-ray. 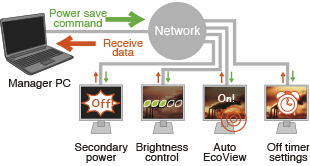 EIZO’s EcoView NET power management software provides centralized control over the power settings of monitors on a network. 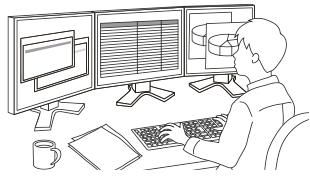 With EcoView NET, a systems administrator can confirm the settings for each monitor on the network, turn the power on or off, and if necessary, take measures to combat eye fatigue such as adjust the brightness or activate Auto EcoView. EcoView NET is available from EIZO distributors. While outsourcing production is now common practice in the monitor industry, EIZO continues to manufacture its products the same way it has throughout its 40-year history – with its own staff at its own factories. This allows EIZO to maintain close control over production quality and offer the industry’s only 5-year manufacturer’s limited warranty. The IPS (in-plane switching) panel offers 178° viewing angles to minimize color shift and contrast when viewing the screen at an angle. This ensures stable and consistent display when two or more people view the screen at once or in a multi-monitor environment. A non-glare screen reduces eye fatigue by dissipating reflective light that otherwise makes the screen difficult to see. This technology helps achieve accurate color by converting the 8-bit PC data to 10-bit, and assigning the ideal gamma values with a 10-bit look-up table (LUT) then returning the data to 8-bit format for display. A slot for attaching a safety lock is included to help prevent theft. With an energy-saving LED backlight, the FlexScan S2133 uses only 13 watts during typical operation. The LED backlight does not contain any mercury for minimal environmental impact when the monitor is eventually disposed of. The EyeCare utility is EIZO -developed software that helps promote better work habits. It consists of a function called “EyeCare Reminder” that reminds you to take scheduled breaks. The gamma, color temperature, and other parameters are adjusted to the proper values on the assembly line. This minimizes variation in color display for consistency in a multi-monitor setups and large scale installations. An overdrive circuit that reduces gray-to-gray response time to just 6 ms when watching video. This greatly reduces ghosting and blurring that is caused by high motion scenes ensuring moving images look clean and sharp. Three input terminals are included – DisplayPort, DVI-D, and D-Sub. The DisplayPort cable can be quickly affixed and detached which makes it convenient for connecting the monitor to a notebook computer. With DisplayPort, you can easily build a multi-monitor environment by using a graphics board that has multiple DisplayPort connectors or a DisplayPort multi-display adapter. EIZO’s five-year warranty is two years or 67% longer than the standard three-year warranty of most brands. Even if the initial purchase price of the FlexScan S2133 is higher than another 21-inch monitor, the TCO (total cost of ownership) will likely be lower due to the significantly longer buying cycle and less need for repair. 2 With current LCD technology, a panel may contain a limited number of missing or flickering pixels. 5 If the monitor is left on continuously over a long period of time, dark smudges or burn-in may appear. To maximize the life of the monitor, we recommend the monitor be turned off periodically. The monitor discerns the input signal from the PC and automatically adjusts the clock, phase, image location, size, etc. In addition, the signal cables that are bundled were developed by EIZO to reduce noise. Adjust the screen to the most comfortable position with 100 mm height adjustment, 30° tilt, 70° swivel, and 90° rotation for portrait mode. For customers that will provide their own VESA-compatible mounting solutions, the FlexScan S1933 is available without a stand. A non-glare screen reduces eye fatigue by dissipating reflective light that otherwise makes the screen difficult to view. Furthermore, the surface of the bezels is treated to prevent light reflection. With EIZO’s Fine Contrast function you can choose from several preset modes for the various applications you work with. Toggling between modes can be done manually in the OSD menu or automatically by assigning a mode to a particular application with the bundled ScreenManager Pro for LCD software. Fine Contrast includes an EyeCare mode that reduces the scree’s brightness to just 3 cd/m2. This ultra-low brightness helps prevent eye fatigue and increase productivity when working in an environment with very dim ambient lighting such as a CAD studio. With both DVI-D and D-Sub mini 15-pin inputs, you can use a computer that has either a digital or an analog graphics board (or both if connected to two computers), and quickly switch between the inputs via a front panel button. Support for sync-on-green ensures this monitor can be used with legacy graphics boards that output this signal. EIZO’s five-year warranty is two years or 67% longer than the standard three-year warranty of most brands. Even if the initial purchase price of the FlexScan S1933 is higher than another 19-inch monitor, the TCO (total cost of ownership) will likely be lower due to the significantly longer buying cycle and less need for repair. IDN enables companies and individuals achieve their imaging, processing and publishing goals to the highest possible standards, with the best possible equipment. Request a Quote from IDN S.A.L. Thank you for your interest. One of our representatives will get in touch with you soon. !